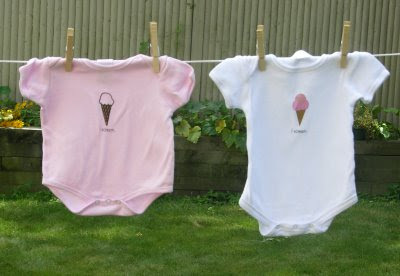 To celebrate National Ice Cream Month, I designed and printed two onesies with ice cream cones on them. Printing both designs is a bit time consuming, so I would really like feedback on which I should continue to print and sell, as well as any comments/feedback on the design itself. my favourite is the one on the white onsie. I love the contrast between the ice cream colour and the onsie colour. It's adorable. People! I love you and your feedback, but please leave me a way to get in touch with you in case you DO win! Thanks!!! I like the one on white the best...though it's a tough call! They are both so cute, but I really love the pink cone on the white onesie. Down the road you could even change the flavor to green for a boy. I love the white one. Just because it would look better with chocolate ice cream spilled on it! i like the white one :) (although i do like both graphics, i'm partial to white shirts. or rather, white onesies? omg!!! i LOVE them! i'm going with the majority on this one---pink ice cream on white background is best, but the other is great, too! i want to have a baby to put into it! 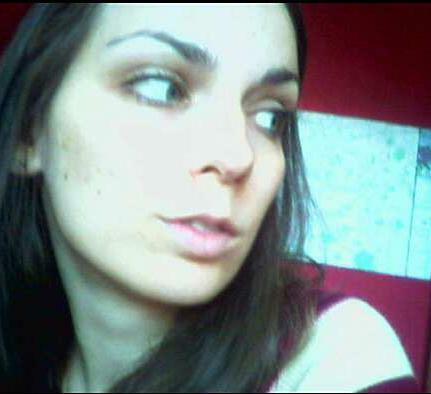 love p.s. you know how to reach me. I like the white one too!! I think both are adorable. 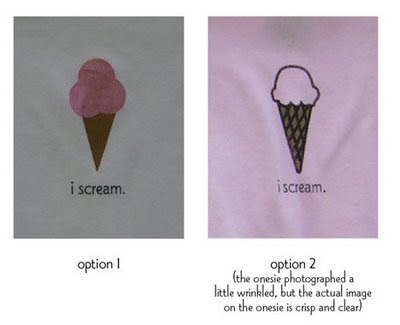 I like the shape of the ice cream on option 1, but like the graphic of option 2 better. What if you created one that was a combo of the two graphics, which would create that "colored outside the lines" look? i like option 1 better! I like the white one with the pink scoops, however I will also suggest doing one with blue scoops so you don’t leave out the little people from the blue population. Very cute! I have often considered an ice-cream design! (I do wood-blocks on onesies, dresses, etc). For what it's worth, I like the one on the left, on the pink onesie. I am partial to the white onesie design. I can't put my finger on why though. Perhaps because the color of the ice cream is very pronounced and makes me want to bite into it. Put a scoop on the baby's bum too. Bite into that! I vote for the white one. Adorable! Both are adorable.!! That pink onesie is my most favorite.